The Racine Scouts, a drum and bugle corps from Wisconsin, perform under the Auburn Schine Theater marquee in Auburn. Members of the Racine Scouts drum and bugle corps play a lunchtime concert Friday at the Auburn Schine Theater. The group is in Auburn to support the renovation project of the art-deco style theater. The Schine Theater sign sits on the sidewalk in front of the theater Friday. Jamie Gibbs plays a bass drum Friday in front of the Schine Theater in Auburn. 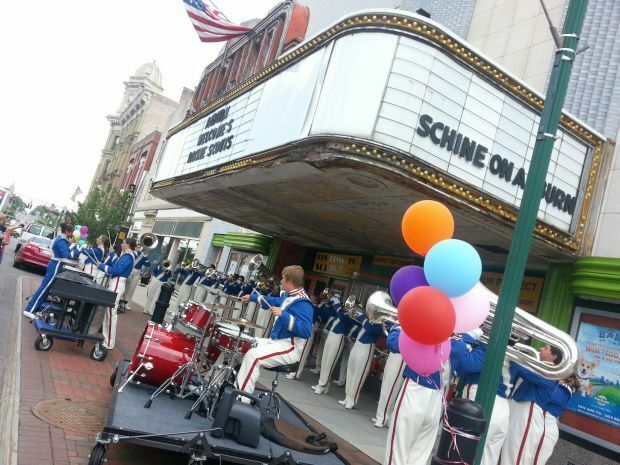 The Racine Scouts bring their drums and bugles to Auburn Friday and prepare to play on the sidewalk in front of the Schine Theater. AUBURN | Few things demonstrate Americana more than the sound of a drum and bugle corps, in uniform, playing a free lunchtime concert outdoors on a picture-perfect summer day. 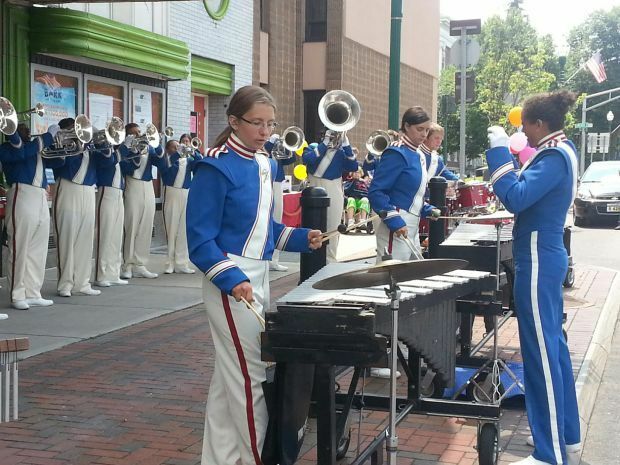 Members of the Racine Scouts Drum and Bugle Corps added a gig to their eastern tour Friday when they played in front of the Auburn Schine Theater before an evening performance at the Auburn Doubledays game. The Wisconsin band showed its support of the renovation efforts by various local organizations to restore the art-deco style theater to its former glory when they played two sets of music for delighted passersby. "We feel very fortunate to be a part of this process even though we're from Racine," said Randy Chafee, executive director. To participate in the rejuvenation of a theater that's almost as old as the corps itself provided the opportunity for band members, ages 14 to 21 who hale from eight states, to advocate for the arts. Tom Shubsda, a 2014 Liverpool High School graduate, is the only New Yorker in the corps and was thrilled to find himself playing his drums so close to home. "It's actually awesome that I get to do a show here," he said. "It's really important for people to have places to go and express their art, so having places like the Schine is important." The corps played an impressive program full of catchy tunes that included nods to the legacies of musical giants from Mozart to Mancini. Standing at crisp attention the approximately 40 youthful musicians played for a crowd of friends, family, strangers and a host of traffic, including an ambulance that sped past with lights and sirens blaring. Renovation project executive Todd Coleman and theater building manager Tim Kerstetter busily prepared for the corps to march to the theater from the Wegman's parking lot. Coleman explained that theater clean-up efforts occur once a month and pointed to repairs made to the theater's facade and a new paint job as signs of the theater's revival. "This is the first time in a long time that there's been live music at the Schine," he said. Coleman, along with members of the Cayuga County Arts Council and Save Our Schine, are awaiting word from the state on whether or not a $1.5 million grant proposal will be awarded to fund renovations. Staff writer Carrie Chantler can be reached at (315) 282-2244 or carrie.chantler@lee.net. Follow her on Twitter @CitizenChantler. The fourth annual IGNITE the Winter will heat up downtown March 6. For more about the Cayuga County Arts Council and its work on behalf of the Auburn Schine Theater renovation project and volunteer opportunities, visit cayugacountyartscouncil.com.